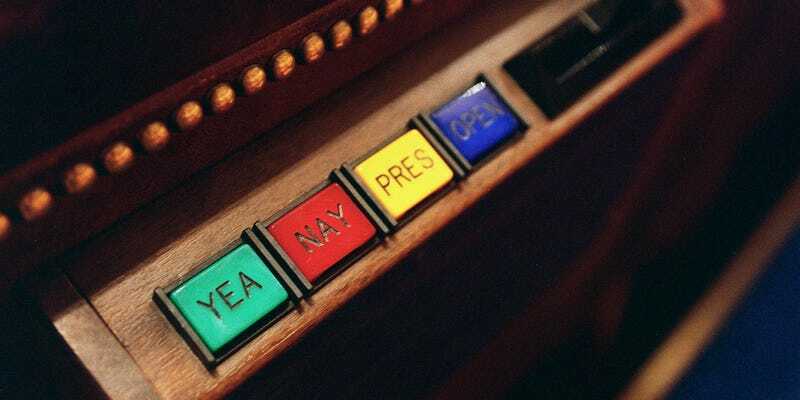 Voting in the House has not changed much since an electronic voting system was first used on January 23, 1973, with the goal of making voting periods shorter. Few votes are held in the format that existed decades ago, when individual names were read aloud, but electronic voting isn’t mandatory. Lawmakers can come down to the well of the chamber, in front of the clerks, and use a system of color-coded cards to write their votes and hand them to a tally clerk. In the final minutes of a vote lawmakers have the opportunity to change their votes if necessary, though to do this they’re sometimes required to vote using the well-card system instead of the EVS machines. Voting attendance has improved over the years: a 1991 Los Angeles Times story reported that 33 representatives had missed more than 10 percent of votes that year. The number of current lawmakers meeting that threshold is down to 21 this year (the House has 435 members, but by tradition the Speaker of the House rarely votes). At the same time, the number of explanations inserted into the Congressional Record also has gone up, from 441 during 1991–1992 to 1,353 in 2009–2010. It has since dropped off: the number of explanations filed in the last congress (2013–2014) was 740, the lowest in 20 years. This article first appeared on ProbPublica and is republished here under Creative Commons license.